Going green is all the rage for today’s environmentally conscious consumer. You may not think about environmental concerns regarding something as intangible as the Internet. However, Web hosting can leave quite a carbon footprint. 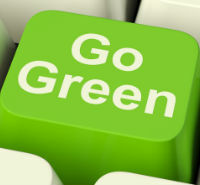 Eco-friendly hosting, or green hosting, looks to minimize the climate impact of your online project. Due to the sheer number of servers in existence, volume of power consumption is the greatest contributing factor to the negative environmental consequences of Web hosting. A green host will look to reduce power consumption as a primary measure to mitigate any damage. You can find info about some Web hosting companies and their green capabilities here: Web hosts. Most of the electricity used is needed to run and cool the servers. Climate control, building power, and electronic security also add to usage levels. For most of the planet, electricity is derived from fossil fuels like coal. There are a number of ways that green Web hosting providers are working to lower their reliance on fossil fuels. A simple step that can be taken is to use equipment that demands less electricity to run. The actual physical server units pull the most power. Levels can be lowered by using servers with solid-state hard drives. Disk drives require a motor which eats up the amps. Also, the way that the internal parts are routed and overall manufacturing quality can be factors, too. Even well-tuned machines can be ineffective if they are not properly utilized. Running smaller tasks on a server may save power for that individual server. However, it is actually greener to have one server run multiple tasks as opposed to having two servers running smaller task levels. Although it may sound counterintuitive, running below capacity can be bad for the environment. Running two machines at 50% capacity uses more electricity than one machine at 100%. Instead of using fans to cool the units and air conditioning to cool the physical building, some green hosts are turning to natural cooling methods. Building data centers in close proximity to lakes and rivers make the use of water as a coolant an environmentally-friendly option. Some hosts use lower underground temperatures to cool the equipment by pumping hot air out through what are called geothermal heat exchange systems (Bet you didn’t think that you were going to have a science lesson today, did you?!). An even more extreme method of cooling is to construct data centers in cold weather climates to capitalize on year-round frigid conditions. So, every method of going green has been to reduce the amount of coal-burning fuel used to run the servers. How about if fossil fuels are eliminated, altogether? Renewable energy sources such as solar and wind are making that more and more likely. In fact, there are some green Web hosting companies that run off of 100% renewable energy resources. Green hosting is not cheap. However, costs are starting to come down. The best green Web hosting providers see the financial benefits of using more energy efficient equipment in their operations. Many are passing the savings on to the customer. Also, you can look to see if the company is green-approved by independent certification organizations. Going green with your Web hosting is a very simple way to make a significant impact towards reducing your carbon footprint. Tread lightly. Eager to learn more about Web hosting, which provider may be the best for you, and how to get started? This is a great resource: Web Hosting Solution Guides.